You have heard about ZuluTrade, but you would like to find out more about it, what it is and is there anything for you? Well, let’s see what benefits you if you chose to invest your money at ZuluTrade. First of all, getting your investment to be productive is very possible and likely. Given that you have some knowledge about trading on forex, of course. It is not simply betting on whether your team wins today or not. There are no favorites in Forex in broad meaning, so training is more than recommended, it’s required actually. Some traders will tell you that first month might even get you to a negative balance, but everyone whom you might ask will assure you that with time, their turnaround became positive. That is, if you ask someone serious who puts effort to what they do. Now for Zulu itself, let’s first say that it isn’t something that you need to learn about for years or months before you start proving your investment right. Also, it is very good thing for beginners as you don’t have to invest much money at the beginning (nor at the later stages if that’s not your thing) with ZuluTrade. 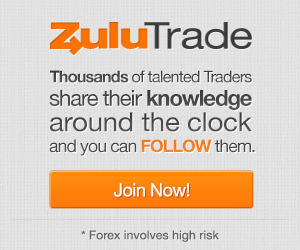 The fact that ZuluTrade works in a way as a social network, you won’t be alone here. Not just that, you don’t even have to trade alone. The option of autotrading, you can follow someone who’s trading you like, and you can copy what they do. In the meantime, you can open yourself a demo account and practice your own trades, while you follow someone more experienced, and by follow here it means do what they do in the real time. More or less, with a couple of clicks, you pick a winner and do automatically do what he/she does. Now, the tricky part when you want to chose someone is that ZuluTrade works as a social network, and the shady side of it is that anyone can appear and introduce themselves as professional traders. The fact that you as a beginner can participate in the social network is a sword with two sides; so can others. There comes your real life strategy of analyzing people and picking people you trust. People can leave comments about others and you can use that as reference for somebody. So you can see who is trusted, and who is not. However, somebody can get negative comments for some non-justified reasons. So, as everywhere, be careful. ZuluTrade used to be pure forex social network, but in 2015, the company introduced binary options. You can track and copy-paste professionals and more experienced traders in either, forex and binary options. There are more than ten thousand people you can copy on Zulu trade. You can narrow your searches through Zulu’s filters, for example you can list only people who have more than two years of experience and who trade with their money, not demo account, and who have a high success rate. There is also a performance table of traders where you can see how which trader has performed. Some reviews showed that a trader managed to be enlisted top five, have some followers gathered around him, and in short time he/she would lose big-time and disappear from the top performers list. That gives you a glimpse of what can happen. You want to rather be the one who successfully follows, than the one who makes top of the table, and suffer a huge loss later. The benefits of Zulu being a social network is that there are many options for following traders and analyzing their behavior. Zulu created option of following the users on your list. You can monitor what they do, and then decide based on your findings, whom you want to follow. You can see what others have made of their lists, and you can also share yours. If you heard anything that might concern you about who are those who you follow, that might be some old news. Since 2014 Zulu has had made a security step forward, as it introduced a system where there can be only a thousand best traders followed. That is for the residents of EU. To make it top 1000, you need to have less than 30% of drawdown, 3 pips or more per each trade profit, and to have had signal sent for the last 12 weeks. These categories represent your seriousness and provide trust for followers. Therefore, if you are from EU, you can be sure that the one you follow is doing the right things. That doesn’t mean that those people can’t make a mistake, but you are sure that they are here for their own benefits. This brings more to the game as it encourages traders to make top 1000, and they show more effort to represent themselves worthy. You can get yourself an app for iOS or Android run mobile devices (phone, tablet), so you can see how your account lives and moves. You can use it to close down trades when you want to manually, if you get an email that the one you have followed started placing crazy calls on impossible trades. You can shut them down anyplace, anytime with your mobile device. You can interconnect your Zulu account with Facebook and Twitter, but basically, it only shows to your non-trading “friends” about your trading moves. You have Zulu for that. However, should you feel any need to interconnect with the two most popular social networks, you can. It is, though, a free advertisement for Zulu itself, and since there is no bonus for you in that, I don’t know. Maybe, actually, that might be a way to make your Facebook friends start following you as a trader, who knows what the future brings. XM is a trading broker working under the patronage of Trading Point, a company working under Cypriot rules and laws. 2016 marks seventh year of successful trading services offering of more than a hundred instruments for trading to the traders all over the world, minus US based traders. The broker claims to be a specialist for Islamic trading. It means that it pays focus on trading in accordance with islamic law, which basically bans dealing with interest. Here it means that there is no swap interest for overnight positions. Interested parties should contact the XM team for additional and more detailed explanation of how to get the interest free account. In order to live up to what it says about how it wants to offer its clients all the best, XM has several trading tools, recognized platforms for trading and a solid customer service. Trading here is allowed from Monday to Friday non-stop. CFD trading is also available, which means that there is trading with metals, energetic goods, and indices. Depositing the said minimum of $5 is easy, and it can get you bonuses should you repeat and raise the stake. Bonuses in terms of +50% until reaching $500 and +20% until the maximum of $5000 can be yours. Even though we must mention methods such are bank transfer, neteller, skrill, iDeal, CashU, Western Union, it is easier to say that you can deposit money any way you want to. When you want to withdraw your money, you will see instant changes to your account, but will have to wait 24 hours until it actually happens, that is, until the money ends up in your pocket. Of course, for safety reasons, document verification is necessary, and the fact that you are a verified user. Another noteworthy fact is that XM asks for a minimum deposit fee of only $5, which is rather low, thus available and attractive to many traders. XM can legally operate across many regions, as it works as a subsidiary of Trading Point. It is regulated by CySEC in Cyprus, for EU the regulator is MiFID, and it is also regulated in UK, Germany, Spain, The Netherlands, Sweden, Finland, Italy, Hungary, France, Poland and Australia. In addition, the New Zealand license enables XM to work throughout regions across the world, except for the US. XM secures its client’s funds with Barclays Bank. Also, there are more offers from XM to secure money. Noteworthy, there is a fund monitoring system that XM uses so the traders can be assured their account doesn’t go to minus. XM has nine trading platforms, of which five are for computers, as well as four intended for mobile devices. The main platform is a version of MetaTrader4, which is here called XM MT4 Terminal. It is based on MT4, adjusted for XM’s vision of good trading. It comes along with “one-click trading”. Traders can choose to place trades automatically, or fully manually. XM gives traders several additional tools to help trade. For mac users, there is also a MT4 version. It is basically the same as regular MT4 Terminal, just completely made for Mac. It dismantles necessity of having a windows emulator, as that might be the case sometimes. Money managers who have need to trade with multiple accounts can use XM’s MT4-based MultiTerminal. As it is made for use of more than one account, it doesn’t come with as many features as the regular one. Still, it offers news, but no charts and analytics. It has a couple of models for execution, and it meets the needs of such traders who use several accounts. XM MAM is basically upgraded MultiTerminal version of MT4. It can be used to trade with multiple accounts, but with full features of regular MT4. Money managers should find this one interesting because it allows trading for several accounts, by using one account. The service support team can give more information about this should someone find it intriguing. A web based trading platform that can be used with either Mac or PC or anything that has a browser and internet. It is fast, without the need to download anything, just hop into XM.com and start trading. You’ll find several trading tools here suitable for a quite serious trading. It is equipped with news, market analysis and it also has economic calendar. It is actually so good that if you are not all that into it for a day, it can get really handy to still try executing some trades quickly. Speaking of executing trades quickly, how about trading on the move? Of course, this is a word about mobile devices platform. And also of course, as any other serious broker, it offers such feature. For “iSomething” users, there is MT4 ipad version. It is so decent and filled with the stuff you need, that sometimes you just might wanna feel like trading from your mobile, rather than turning the computer on, and trade without losing any aspect of the job. There are also platforms for those traders who use devices that run on iOS, Android or even Windows. I say “even Windows” as it is yet to be waited to see everybody start developing apps for windows mobile devices. I noticed that many apps were not made for windows, including many brokers. Somebody had bought a Windows-based Lumia, and you as a trader want that somebody to buy a new phone? No – offer them app for windows. XM did. As a regular serious broker, XM apparently keeps up with expectations regarding customer support team. The company pays attention to it and with more than twenty languages; people from almost any country of the world can get answers and help without using dictionaries and interpreters. The support team can be reached either by a phone or chat, non-stop, from Monday to Friday. Even during the weekends, the team is available, but only from 9am to 5pm (CET + 2). You can expect an Email reply in two days tops – depending on the timezone and the specific problem you might have. But no more than two days whatever the situation is. Well, at least what XM promises. EXNESS is a trading platform for CFDs and Forex. Its main office is situated in Cypruss. In addition, it has St. Vincent branch offices, one in Russia and another in Grenadines. The company (LTD) is regulated in Cyprus by CySEC where it is headquartered. Clients are entitled to get bonuses for registering and also to get more bonuses for promoting the company itself. Bonuses are measured usually in percentage of a certain achievement. For example, for depositing money, a new trader can get as much as 35%. Other bonuses can be obtained through different accounts. There is a bonus program called “profit ladder”. It works based on the trading volume. In a bonus program called “Golden Ladder” the bonuses are connected to the gold price and the measure of clients’ trading volume. Simply said, the more a trader trades, larger the bonus becomes. Holders of classic accounts can get a bonus for depositing and filling their account, but unlike the new traders, classic account holders get 10% of their bonus. Another way to get bonuses is through contests. There is contest each month for holders of mini accounts, and it rewards five best traders with $800-$2,400. Another contest for holders of Mini account, called success 35, enables best traders to get up to $500. Firs gets $500, half in cash, half in bonus to their account. Second placed gets $300, third placed $200 and a hundred bucks to each fourth and fifth placed trader. Exness has four types of accounts. The basic one here is called “cent”. It is most suitable for beginners as it doesn’t have minimum deposit and it has a leverage of 2000:1. This account is called “cent” because its denomination is in cents. Users can not use hedging nor experts. Level of margin call is 60%, and the level of stop out is 30%. Mini account also doesn’t have minimum deposit and has the same leverage as “cent” account. It also has the same levels of margin calls as well as the stop outs. But here, the maximum size of a trade is not set and trading can be done with hedging or experts. The level of margin call is set to 30% and the level of stop out at 10%. Fourth account is the ECN. It has a commission of minimum $25 per traded standard lot, along with a at least 0.1 lots trade size. The level of a margin call is 100%, stop out level is 50% with the leverage being 200:1. Also, there is access from multi-bank to the market. EXNESS offers to its traders several platforms including the MetaTrader4. All four types of accounts can trade on MT4. Next, there is Exness Webtrader. It is MT4 platform, but web-based. It allows traders to access the platform from any browser. Mobile platforms are also available. For iPhone or iPad there is “iTrader”, for android-run devices there is droidTrader and unlike some othere, Exness has something for Windows based mobile devices – ExnessMT4. Exness offers its client support in terms of training and educational materials including webinars and online lessons, forex analytics, and for holders of live account, VPS service. Depositing money has been made as easy as possible. It can be payed via prepaid Excard. There is also an option to use Skrill, Payweb, Flispay, Neteller, Ukash, Perfect Money, or Cash U. Also, bank cards such are JCB, VISA, Master, union pay are option to deposit money, as well as bank wires. All these methods can be used for withdrawing. As for minimum depositing, it depends on the way of depositing. Bank transfers require minimum of $10. Nteller and skrill also $10, while Excard payments, internal transfers, Ukash ,cashU or webmoney can be used to deposit as little as $1. But what do you plan doing with it? As for maximum payments, there are no limits, again with exception for methods that have certain specific restrictions. As for the withdrawing limits, it is the same to depositing – limits are only imposed by the method to withdraw money, and that is up to the money transfer provider. There is a rising amount of beings discovering the pros of capitalizing in a foreign currency. This is just one of the reasons why Easy-Forex.com has rapidly becoming one of the largest players in the internet trading market. People do not need to be dependent on brokers or with the banks to be able to accomplish a transaction. Nowadays, regardless if you are at home, you can get by the minute info about the conversation charges and you can also mingle with the investment funds. It will be a bold part for people who speculate whenever they seek for instant results from the savings and a lot of people truly feel comfy when it comes to the level of stability visible in the forex world. When you invest in forex, that may bring you extra money, this is one of the reasons why this part of finance has been so persuading to a lot of people these days. EasyMarkets (former Easy forex) has made the entire procedure of investing in forex as an easy and simple so that normally, anyone can really try their luck. What is more inviting is that, there are also tutorials of how you can easily comprehend the trading practices for beginners in this type of investment process. There no frustrating software for you without using Easy-Forex.com. Anyone who went through this instance can relate to the problem, program and even glitches and may be thankful for the kind of service that they offer. You just need to login to the account anywhere you are as long as there is an internet connection. When you use a competitive spread, the company will eradicate the need for commissions by coming up with the money via the spreads that were known into the currency rates. Forex and CFDs traders globally are without a doubt familiar with markets.com, but if there are those who are yet to dive into the world of trading this way, have some thoughts on this provider. Markets.com provides a number of trading platforms with MT4 included. This company’s customer support that comes in more than 20 languages is an award winning segment of markets.com. It is regulated by Cypriot CySEC, which enables it to have a large number of users that trust this broker. It also has authorization by several European authorities among which are Banque de France, BaFIN, and FCA. As a means to expand its reach to more worldwide clients, the company has become partners with the English football club Arsenal in October 2014. That fact to some extent shows all the seriousness of this broker as we can read in Markets.com Review. Markets.com doesn’t take make any charges, as it boost itself to be big enough to not need those aspects of doing business. In addition, it offers quick trades execution and tight spreads. The lowest entrance for investing is $100. Giving an overall insight, let’s mention that market analysis and comprehensive commentary with updates from regular market are there for trades to follow the trends and situation in the market for providing them a good atmosphere and surroundings. Several financial tools enable trading options, fixed spreads, or variable ones. Account management is at a high level and packages for clients are designed to fit ones needs. The first deposit can get you a bonus of 10% and a full pack of tutorial tools are at customers’ disposal. Markets.com offers three distinguished accounts for trading; classic account with the mentioned minimum of $100 for depositing to begin trading, a standard account that needs to be kicked off with $2500, and premium account for those who can afford to invest $20.000 or more. The benefits of standard account compared to a classic account provided here are seen in a special account manager, signals and news via SMS, as well as Premium analysis on a daily basis. The major account, premium, in addition has a higher level customer support. In addition, you can open a practice account before switching to real money account. This broker offers its clients several platforms for trading. Those are Market MultiTreminal, already mentioned MetaTrader, there is SirixWeb Trader, Markets Mobila Trader, and a Web Trader. The platform for CFD and Forex can be fully downloaded or optimized for web or mobile trading with one account. Noteworthy is that Markets was highly praised by the London Investor Show Forex Awards in 2012, and was elected the Best Forex Platform. Traders won’t find any difficulties with depositing money, as Credit or Debit Cards are accepted, Bank Transfer, Web Money, POLi, as well as Wire Transfer, all which are proven methods of depositing money. A wide variety of markets include 200 assets for trading, and those are bonds, indices, gold, silver, oil and stocks. Indices include S&P 500, nasdaq100, FTSE100, Nikkei225, DAX30, Hang Senf, BITCOIN, VIX, MICEX and USDX. Euro-bund 10Y, Japan G, Bonds, gilt-long UK, TBOND-30Y are to be found among bonds. Gold& silver has 100:1 leverage as well as fixed spreads. Clients can also trade with eBay stocks, Apple, Petro China, Sony, Toyota, and many more. Leverage for trading stocks is 20:1, and crude oil goes with fixed spreads with leverage being up to 20:1. Forex traders have EUR/USD, USD/JPY, USD/CHF, and GBP/USD currency pairs for trading. As for these currency pairs’ spreads, they are listed at 3 pips with leverage of 200:1. Markets.com is open five working days of the week, all day long. There is a nice free bonus of 25 units of your chosen currency (EUR/GBP/USD) that you can get upon registration with verifying mobile number, and using a 3-digit code you get via SMS to verify account. You can withdraw your bonus upon satisfying the volumes of trading of $10.000 for each bonus dollar gotten. For referring a friend to Markets, there is a reward. Trader will get 20% for money that a friend deposits (100-500 USD), while the friend gets $50. The friend-referral based bonus of your friend will increase with the deposited amount increasing. The most the free bonus can reach $400 for more than $10K up to $20K. The referred friend can get a bonus between $1000 and $2000, accordingly affected by the deposited amount. Market.com has whole day available customer support, except for the weekends. The team can be reached by the phone in 35 different countries. It can be reached by email, and there are several segments you can forward your message to. As for response time, markets.com pays attention to be as prompt as possible, and in addition, there is a live chat line. Markets.com pays attention to the safety for its clients, which is actually in line with all the serious trading sites. Clients are assured to have encrypted communications with markets.com which has SafeCap investments and data centers that are certified with SAS 70. For protecting transmitted information, there is SSL software. The customers have segregated accounts. As for the security protocols, there is R&D team. Also, there is a fund for investor compensation of $20K for each client. The interface of the website is designed so it is easily found what you look for and as for platforms for trading; they are easily accessible and easy to download. AvaTrade was founded in 2006 and it has been known for its user friendly environment for trading with the utilization of high quality trading platforms. Ava Trade platforms for trading have been confirmed as dependable by over 200K users that execute trades exceeding 2 million monthly. Ava Trade also assures that noted financial institutions are backing its software platforms.You can read more in Avatrade Review. Ava Trade offers a number of educational tools for enabling traders to make the most of their investments. Services available on Ava Trade are enhanced with possibilities for mobile as well as online trading. The possibility to keep track of the newest headlines from the financial world, have yourself informed through analysis of the market and follow the fresh changes are there to help traders place trades in the right time. Ava Trade is a daughter company of Ava Group, the company which has licenses for operating in Ireland, Japan, and Australia. Prior to trading at AvaTrade, you can opt for a Demo version of account. It enables traders to act normally, with demo money, as they would do it with real money. Thus, without losing your money, you are able to execute trades and get along with the interface and around the platform. Should you like how it looks in the preview version, you can proceed to trading with real world money. To do that, on Ava Trade you have four different accounts for real trading, each based on the level of your abilities and your needs. They are named symbolically Gold, Silver, Platinum, and Ava Select. Several trading platforms, including AvaTrader, will give you something to think about. Besides MT4, the globally popular platform about which all has been said, AvaTrader is specialized for utilization on AvaTrade. It offers single click Forex trading, it is packed with news feeds and analysis as well as charts that you can pull a lot from. It is possible to download AvaTrader to several devices, and it can only be used downloaded. As for all-said-about MetaTrader4, we can repeat once again that it’s without a doubt the most popular global trading platform equipped with many helpful features among which are quick execution, transparent pricing, and it is supported in many languages. AvaTrade has more to offer as it has a specially designed Mac platform. As the name reveals, it is dedicated to those who use Mac platforms, which allows you to trade many markets, including Forex. Web-based trading platform is fully applicable for trading on your browser. Without downloading anything, you can start trading directly on your browser. For depositing funds and withdrawing money and you can use credit cards, including Ava’s Debit MasterCard. Ava Trade assures clients that the security of bank transactions is at the highest level. To deposit money, it won’t take you long time. As this review didn’t have the opportunity to check in person the situation when withdrawing, we can’t comment that, but trust Ava Trade that it is secured and as prompt as possible. At Ava Trade, financial instruments that can be traded are stocks, indices, CFDs, commodities, currencies, Litecoin, ETF Trading and Treasuries & Bonds. As for commodities, Ava Trade offers oil and gas, copper, platinum, gold, corn and others. Traders can trade with Microsoft, Cat, Boeing, Yahoo, ExxonMobil, Twitter, GM, and others. Indices included at Ava Trade are s&P500, DJ 30, NASDAQ, Russel2000, and others. Ava Trade offers several bonuses and promotions. That also includes rewards for new promotion and referring friends if you consider yourself an established trader at Ava Trade. If you are yet to join, for depositing $200 you get a cash bonus. For successful referring new traders, you can get minimum $75 and maximum $400. A successful referral is the one when a person you get to Ava Trade begins trading, actually, by placing their deposit. Ava Trade’s customer support is available all the time. Choosing among live chat, telephone and email, you can reach contact team. As for telephone, there are separate lines for separate regions among which are Australia and New Zealand, Latin America, Middle East, Asia, North America, Africa and Europe. The team that you can reach is a professional one, and their response will be polite, prompt and helpful. However, if there are things you would want to ask that could be rather simple, there is a “FAQ” section where you can answers to the majority of the basic issues. Site offers all of these information which are accessible to everybody to check themselves. Several European Union member countries regulate and license Ava Trade. As for the personal information Ava Trade collects, it is – as they say – used for official business and it isn’t shared to other parties. SSL encryption protects the website while banking security is conducted via firewalls and other features. Since FxPro has limitless, it can deliver a sufficient volume to have the capacity to secure to a great degree focused costs. Every time you get dropped quotations from them, they pick the best offer and ask costs conceivable. Consequently, FxPro’s case is about getting the best costs regardless of the possibility that diverse liquidity suppliers produce them. Client administration at FxPro will be serving you 24 hours daily, 5 days per week. It is also keeping an eye on by bilingual staff equipped to give the most noteworthy nature of bolster conceivable in all regions relating to exchanging. Telephone & fax numbers, along with email locations are available in the website regions and areas of FxPro. Live talk is additionally accessible for the individuals who want to utilize it. you can check the contact us segment on FxPro’s site. Limitation free exchanging systems and styles. Incredible liquidity offered by its Top Tier liquidity suppliers. All requests are implemented with distinguished quality. Irreconcilable situations are wiped out. All exchange exercises are totally cryptic significance, no exchange attributes or delicate data about the merchants are available to the liquidity suppliers. The customer care is accessible all day, every day throughout the year and it is accessible in 14 noteworthy dialects including Spanish, Greek, Chinese, Hungarians, German, Portuguese, Polish, and Arabic And Vietnamese. Client backing can be reached by merchants through Email as well as Live talk. Generally, beside a couple hiccups, FxPro Forex Trading Broker is a tried and true and believable specialist. A large number of the customer’s shows that they’re not for the most part miserable with the level of administration gave by the association. FxPro performs awesome as far as accessible stages as well as it bids you incredible exchanging conditions as well. With a backing and extensive variety of installment systems, FxPro is without a doubt a representative that is highly recommended.